Yay, another featured dish! I'm going to attempt to post these up every Monday morning from now on - a little inspiration for the week ahead! I had the Bo Peep at St. Ali a short while ago, when I was invited to try out their new menu. If you've been to St. Ali before, (and I'm sure that means most of you), you'll know that the portions can be very generous, and between the two of us, we only managed to try two items from the new menu. I must admit we weren't very impressed by the Friends with Benefits waffle stack ($18.50), which came out lukewarm, drenched in syrup and was overpoweringly sweet. However, I totally adored the Bo Peep. Adored it! The day we visited, it happened to be blisteringly cold and wet, and this hearty dish really hit the spot. There were generous pieces of tender slow-cooked lamb and chunks of potatoes and carrots, all in a gorgeously rich gravy. 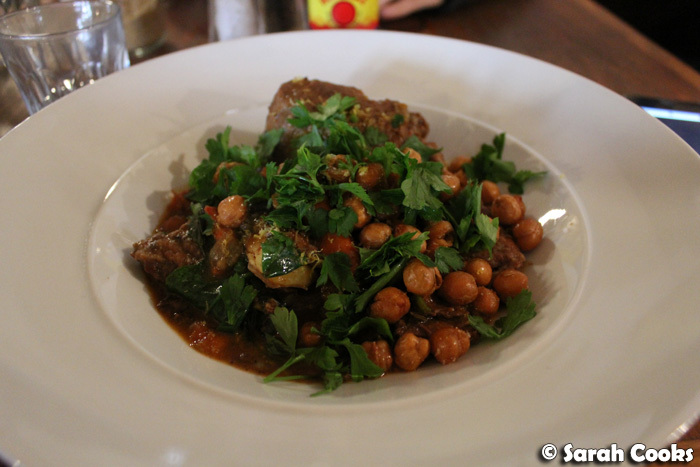 I loved the generous garnish of flat leaf parsley, and the textural interest provided by crisp chickpeas. Reading the menu description of "pan fried chickpeas", I thought they'd be ordinary soft chickpeas heated through in a pan, but they were more like crisp little bar snacks - an unexpected, but totally welcome component. I thought of it as a homely dish, done in a sophisticated way - a really excellent meal. Sarah and Sandra ate lunch as guests of St. Ali. mmmm.. lammb! I've only been to St Ali once and it was for that vitasoy thingo. Shellie - Their food is usually really nice too, and they do nice juices etc, so worth a visit even if you're not a coffee drinker! Lorraine - Isn't it cute! The dish was definitely hearty and not little and cute though! Adrian - Thanks! You should get down there to try it, so yum!